We're born and bred Irish and have fierce pride in our lovable rogue of a country! The culture, history, scenery, food and craic is unbeatable. But with the good always comes some bad and Ireland is no stranger to tough times. We left college right as the recession hit. Family, friends and thousands of Irish people were packing up to pursue opportunities that were no longer available on our Emerald Isle. After the emigration rush, we watched our friends, family, colleagues and every Mary & John from down the road spend hours crafting the perfect care package for their loved one abroad. Deciding what those loved ones miss most from Ireland and trying to condense it into one box without sending the family dog was a serious task. They were driven up the walls finding time to go into different shops, comparing prices and picking the perfect care package, not to mention spending a small fortune getting the packages sent overseas. Queue light bulb moment – we knew there had to be an easier and cheaper way of sending visitors to Ireland and people that live abroad Irish products while keeping it personal and uniquely Irish at the same time. 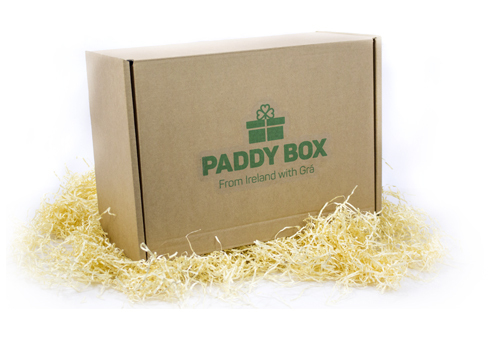 After loads of research, surveys, late night chats, pints, cups of tea with friends, family and anybody who'd listen, The Paddy Box was born. Being away from Ireland is hard (even if you just visited us) - The Paddy Box aims to connect those around the world to Ireland by allowing customers to create and ship a box of ‘Irishness’ around the globe. The instant joy and emotion we've seen from people opening our boxes is the reason we set up The Paddy Box. There's no better feeling than making someone's day and we know you will feel the same when you send and/or receive a Paddy Box.